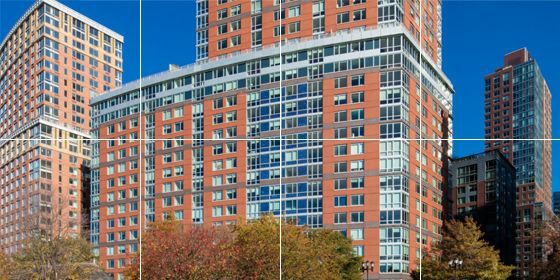 G/BA provided energy efficiency engineering studies and retro-commissioning of existing systems at the 357,000-square-foot luxury high-rise apartment building in Manhattan’s Battery Park City neighborhood. The Solaire, part of the Albanese Organization portfolio, is a luxury residential facility built in 2003. G/BA staff have performed multiple projects at this 28-story LEED EB Platinum building. The energy audit and retro-commissioning project aimed to satisfy and exceed the requirements of New York City Local Law 87. Mechanical, plumbing, and electrical systems were analyzed for performance and opportunities for energy conservation measures. The existing humidifiers on the air-handling units were electric. The annual cost saving of converting to gas-fired humidifiers was calculated at $95,000, with a simple payback of two years. The existing unit heaters were found to have been installed without control valves. Installing control valves on all 12 unit heaters yielded annual cost savings of $8,658, with a payback of less than one year. During the water treatment plant evaluation, the retro-commissioning staff recommended that two motors be upgraded to premium-efficiency motors. The annual cost saving was $5,200, with a simple payback of just over one year. Numerous sensors were found to be out of calibration on the air-handlers and fan coil units. This led to excess heating and cooling. The annual cost savings of calibrating the sensors was $6,600. The existing condenser water pumps were constant speed. The annual cost savings of installing variable frequency drives on the condenser water pumps was calculated at $22,200, with a simple payback of under two years. The combined annual cost savings for the energy audit and retro-commissioning project, including energy conservation measures not listed above, was $178,833, with an average simple payback of 1.78 years. The total implementation cost was $317,537. G/BA helped the client apply for incentives through the Con Edison Commercial and Industrial Energy Efficiency Program.